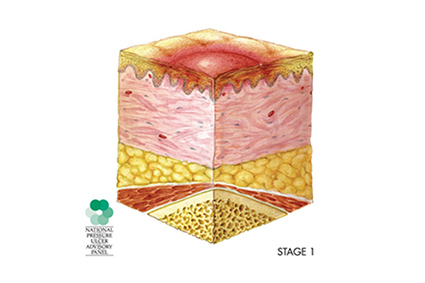 A pressure sore (also called pressure ulcer, decubitus ulcer, decubiti (plural), bedsore or skin breakdown) is an area of the skin or underlying tissue (muscle, bone) that is damaged due to loss of blood flow to the area. Blood flow to the skin keeps it alive and healthy. If the skin does not get blood, it will die. Normally the nerves send messages of pain or discomfort to your brain to let you know when to move to relieve pressure, stay away from hot surfaces, or shift your weight. After injury, messages from the sensory nerves may not normally reach the brain. With little or no feeling, you have no warning signs to tell you that you have been in one position too long and that something is pressing against your skin causing it harm.